Soy milk is a soybean-derived beverage that is a popular substitute for cow's milk. While many vegans and those with digestive problems are forced to drink soy milk, it can actually provide certain nutritional benefits to all consumers. However, certain factors must be considered before you switch from cow's milk to soy milk. Soy milk is a beverage made from soybeans after they are soaked and ground with water. After the beans are ground into a smooth liquid, the beverage is boiled and cooled. It is then ready to drink. Soy milk can be a healthy alternative to cow's milk. Unlike cow's milk, soy milk has very little saturated fat and no cholesterol. In fact, soy milk can actually help lower your cholesterol level. This can aid in reducing your risk of heart disease. Soy milk also has roughly the same amount of protein found in cow's milk. In addition, soy milk has fewer chemicals, low sodium and high levels of manganese, thiamine and dietary fiber. Aside from heart disease, some research has been done to link soy with a decreased likelihood of other serious medical conditions. Evidence suggests soy can help prevent hormone-related cancers. 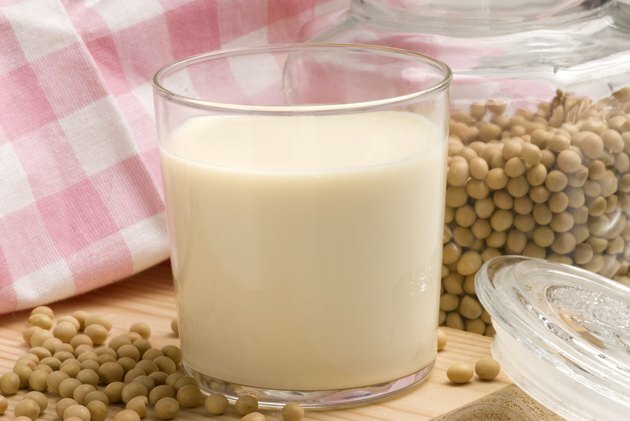 Soy can also help ease symptoms of osteoarthritis and menopause. Soy milk may be the milk of choice for certain digestive problems. One major digestive problem is lactose intolerance. Lactose is a sugar found naturally in cow's milk that many children and adults cannot digest properly. It results in symptoms including nausea, vomiting, diarrhea and cramps. Soy milk, however, is lactose free and allows the drinker to consume milk without the side effects. Casein is another ingredient that can cause problems in certain individuals. Casein is a protein found in cow's milk. It can cause allergy symptoms and immune system malfunctions. It can also cause problems in people with asthma or sinus infections. Because protein is a vital component of maintaining proper health, soy milk is a good option for those who cannot consume cow's milk. While soy milk does have some calcium, it is not a good source of the nutrient and does not measure up to cow's milk. Most of the calcium found in soy milk is attached to the pulp of the bean. The pulp, however, is indigestible in the human body. Calcium is an extremely important nutrient. It is vital in, among other things, maintaining bone strength. Therefore, it is important to find a soy milk that is fortified with calcium. If not, make sure to add calcium in other parts of your diet. One of the major hurdles when switching to soy milk is the taste. It may take time to adjust to the slightly bean-flavored taste. If you do switch to soy milk, you may have to try several brands and flavors to try to find one you enjoy. Fortunately, many soy milk brands produce flavored products, including vanilla and chocolate flavor, to help consumers enjoy the taste.